A new analysis breaks down how often schools and teachers are using the ed-tech tools bought by their districts. The findings are not pretty. A median of 30 percent of the ed-tech licenses purchased by K-12 districts–as tracked through a proprietary platform–are never used. 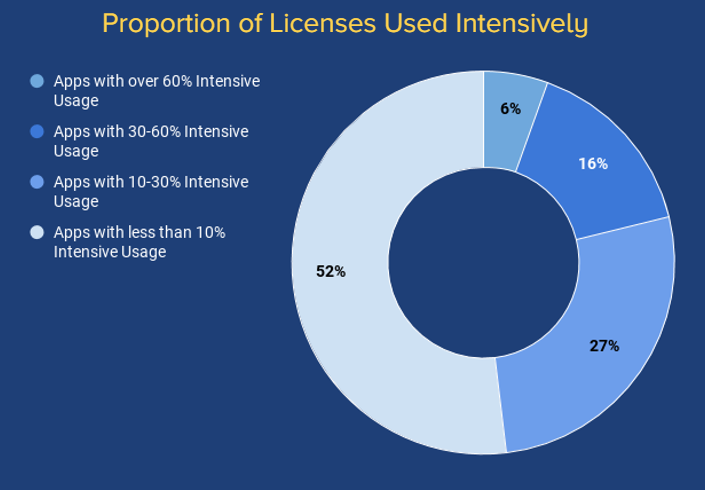 And a median of 97.6 ed-tech licenses are never used “intensively,” according to a report by Brightbytes, a San Francisco-based company focused on data use and analytics in schools. The results are based on an analysis by researchers using data from the Brightbytes Learning Outcomes module, a system that collects data from the company’s district clients via each school system’s web proxy. Researchers used the data from Brightbytes to make a variety of conclusions in its report, including correlations between usage of products and achievement. The company has released a summary of the analysis, with its methods and findings, to the public. The report is based on a set of data based on 48 districts, 393,000 students, and 177 apps–which Brightbytes defines as browser-based online curricular and learning tools. The districts studied were of different sizes, with enrollments from more than 30,000 students to less than 1,000. Districts have become much more intent on tracking product usage data over the years, for a variety of reasons. One is that they want to see if teachers and students are engaged with lessons and with the ed tech that administrators purchase–often at a big cost. Districts also want to know if individual products are helping them accomplish specific goals, particularly in driving up academic achievement. K-12 leaders also want to know that they’re getting what they’re paying for from ed-tech tools, especially if they’re being charged through a per-user license. Brightbytes defines a “user” as someone who has ever logged into an app, and an “intensive” user as someone who used the tool at least 10 hours between two different assessments covering the content related to the tool. The lead author on the analysis is Ryan Baker, an associate professor at the University of Pennsylvania’s graduate school of education. Ideally, said Baker, the analysis will prompt more district officials to scrutinize their agreements with vendors and ask the right questions to know if they’re being overcharged, and if a product is a good match for their district. Right now, the data clearly show many districts are “getting a lot more licenses than they’re actually using,” he said. The report’s findings about lackluster usage of ed-tech is consistent with other analyses showing a big gap between promises made about K-12 products’ take-up and reality in the classroom, said Christina Luke, the director for program and product evaluation at the nonprofit organization Digital Promise. One of the main reasons products sit idle is because administrators–who typically captain purchasing decisions–and teachers don’t agree about whether an ed-tech tool has value and how it should be used, said Luke. In addition, teachers with a shaky grasp of how the tech works may be reluctant to take it up, said Luke, whose organization tries to improve the quality of research and technology in schools. Broadly speaking, the increased, data-driven focus on whether products are actually being used is a good thing for schools, financially and educationally. “We’re hearing more of that conversation,” Luke said. It’s part, she said, of districts making “evidence-based decisions” about products. Does this research include a district’s inability to handle purchased technology such as an inadequate amount of bandwidth? Most of our classroom/school technology is unable to access WiFi on a regular basis. This leaves teachers unable to rely on technology, not that we are unfamiliar or not willing to use it. Hi Sean, Thanks for the study! While it is disconcerting to hear that some software licenses are never used, I would question the assumption that intensive use of all such subscriptions is optimal. Some many be used by students and teachers very effectively for a specific lesson or unit for a brief time. That doesn’t mean they didn’t extract value from the app. A more fine-grained approach to the study, where licenses are grouped by applicability for long-term intensive use, might provide more useful and actionable information.